Different interactions that take place in VT collaboration can follow the time, interaction and performace (TIP) theory. Transformational leadership aims at motivating team members by showing her consideration for individuals and providing intellectual support. leader as organizer: coordinator role by planning and allocating the work across team members and clearly defining the role of everyone. Leader should set goals, provide deadlines and select team members. leader as trust and cohesion builder: building a social presence and developing interpersonal relations; support transmitting socio-relational knowledge, cohesion and trust; care less about control and more about developing interpersonal relations. shared: power and influence is distributed across a group of people; rotation and allocation of leadership can increase efficiency by optimally benefiting from the expertise dispersed across team members. Provide structure by organizing tasks across the team, sets goals, and deadlines. Promote the development of interpersonal ties and trust across people. Either attributed to a single person, allocated across a group of individuals or carried out through rotation. Medium of collaboration: Should conform to the needs of knowledge sharing preferred by the VT and be capable of delivering different forms of information (e.g. written, oral, and corporal) at the right time with the desired structure. Managerial approach/style: Provided with a structure by guiding VT members in the use of technologies; managers also promote trust building and group cohesion. Karoui, M., Gürkan, A. & Dudezert, A. 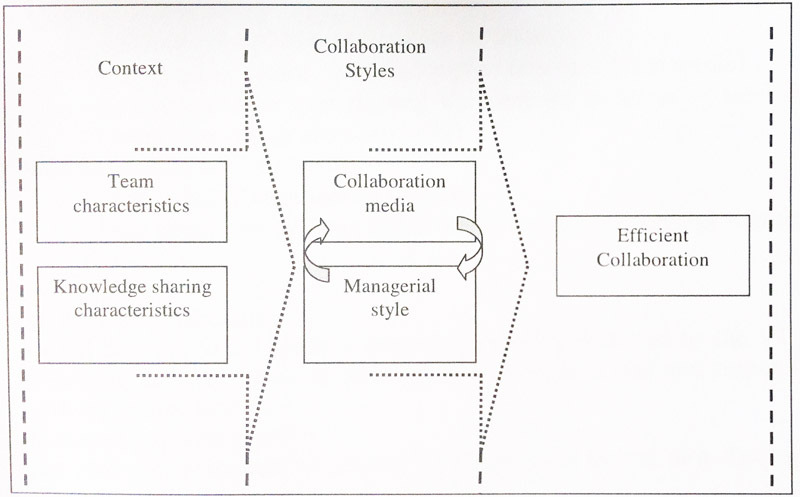 (2010): Virtual Team Collaboration: A Review of Literature and Perspectives. Proceedings of the Sixteenth Americas Conference on Information Systems, Lima, Peru.